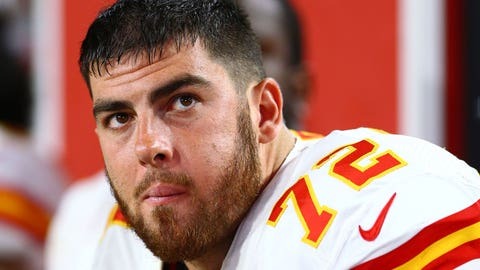 The Chiefs may have gotten the win on Sunday in Houston, but the buzz in the Kansas City media and locker room was over 2013 top pick Eric Fisher, and whether he sat out on purpose to avoid facing J.J. Watt. For nearly every breathing person capable of reason, the thought of spending three hours lined up against — and butting heads with — J.J. Watt for three hours is enough to call in sick for the day. Or more. But for an NFL offensive tackle, particularly one selected No. 1 overall in the draft, that isn’t supposed to be the case. But after pregame reports raised some eyebrows Sunday morning, that’s just what a former NFL player alleged in a tweet. And that tweet set off a firestorm that burned well beyond the final whistle of the Chiefs’ 27-20 win over the Texans. And when the game started, recent acquisition Jah Reid started at right tackle. When the game was over, both Fisher, the No. 1 overall pick in 2013, and Kansas City coach Andy Reid defended Fisher’s character and tried to clarify the situation to the media. "[The Chiefs coaches and medical staff] just said the medicals weren’t ready yet and that I was a backup, emergency player," Fisher said, according to ESPN.com. "It was completely their decision." Reid said the decision to sit Fisher was his, not his player’s. "It just looked like it," ESPN quoted Reid as saying. "I got to the point where it wasn’t getting better. So from that point, I had to make a decision and there was no time. We are talking Friday, right? I looked at the tape on Thursday … and it wasn’t right. He was trying to push through, but he was having a hard time getting his hips through and … so I said, ‘Hey, listen, we can’t put him in a position like that.’ So we went with Jah." ESPN later reported that Smith actually emailed reporter Bob Holtzman and admitted he had never met Fisher. But he also stood by his tweet. "It’s my opinion and I played with guys that be scared of a challenge in the locker room we call them Jag= just another guy," ESPN said Smith wrote in the email.